A new attraction will be featured on our Calgary Stampede tour this year. We will be visiting the Northern Lights Wolf Centre. If you are like me, your knowledge about wolves came from books or movies and did not give a very true picture of what these magnificent creatures all about. The first story I remember reading about wolves was Little Red Riding Hood and one of my favourite movies with Kevin Costner was “Dances with Wolves” in which Costner as Lieutenant Dunbar and a lone wolf form a bond. 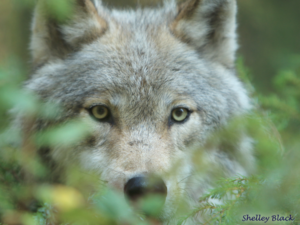 There are many more books and articles written about wolves and they are one of the world’s most written about wildlife species because of their long history with humans and livestock. The gray wolf (or grey wolf) also known as the western or timber wolf and is native to North America. This is the species you will meet at the Northern Lights Wolf Centre. Wolves are gregarious mammals that live in packs or family units. The unit is usually made up of 2 adult males, 2 to 4 juveniles and 1–3 yearlings. The gray wolf is generally monogamous, with mated pairs usually remaining together for life. 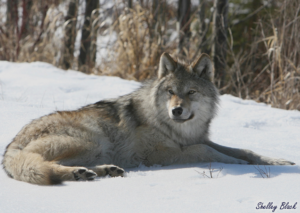 Upon the death of one mated wolf, the survivor will quickly find a new mate. The Northern Lights Wolf Centre is home to 7 wolves and 1 wolf/dog. There are clean outhouse style washrooms on site and a small gift shop. For groups, the staff at the Centre will provide an opportunity to hear the wolves howl. I hope you will find your visit to this unique site informative and leave with a new understanding about the role these beautiful creatures play in our environment.